Casper invited me to spend a week with our good friend Caroline and his sister Laura at a primate-research project in Borneo, Indonesia. Casper’s friend Matt, the communications director of the Orangutan Tropical peatland project and avid wildlife photographer, had offered to host us. On December 31st 2013, I booked my flight from Bangalore to Kalimantan – starting the new year with an adventure inspired by this article. It was a great decision. Orangutans are beautiful animals. At rest in the crown of the forest, they look similar to a man sitting in a tree, honoring the origin of their name: “person of the forest”. In their natural habitat they are solitary – orangutans live alone. They feed primarily on fruits and some leaves growing in the rainforest canopy. Males grow flanges (the big cheeks you recognize from pictures) when they start to get ready to reproduce. Few females in the animal kingdom are as dedicated to being a good mother: young Orangutans stay with their mother for 7 to 9 years before they gather their own food. The Borneo Orangutan Survival foundation operates a rehabilitation centre where orphaned Orangutans are fed and nursed to go back into the wild. To get re-acquainted to living in natural forest, Orangutans spend months to years at the half-way stop, an island in a river where they can room around freely but still receive food. Every morning a boat drops bags full of vegetables and fruits at several feeding locations on the island’s banks. We were lucky to see this spectacle from a boat moored at a few meters distance. After one bag of ears of corn had been emptied, one of the Orangutans – let’s call him Alfred – showed us his inventiveness. Alfred ripped open the bag along one side and put it over his head a cape. Fed up with the cape, he put the canvas material under his armpit and climbed up a tree to show us some rapid prototyping skills. Alfred hang one side of the cape onto a branch and tried to crawl into the canvas bag to use it as a hammock. Once he succeeded, preparing to take a nap, one of his friends came to claim his hierarchy by stealing the bag. Alfred was scared out of the tree, but his fellow Orangutan did not have the perseverance or curiosity to make a hammock out of the bag – it looked so much easier when his friend had done it – and threw the bag down into the river (as for humans, easy access to an object often seems to reduce the pleasure experienced of that object). Alfred climbed down immediately to fish the bag from the river, trying to make a hammock once again. A creative, persistent fellow. Before visiting the BOS foundation, we spent two days in the natural forest with OUTrop. 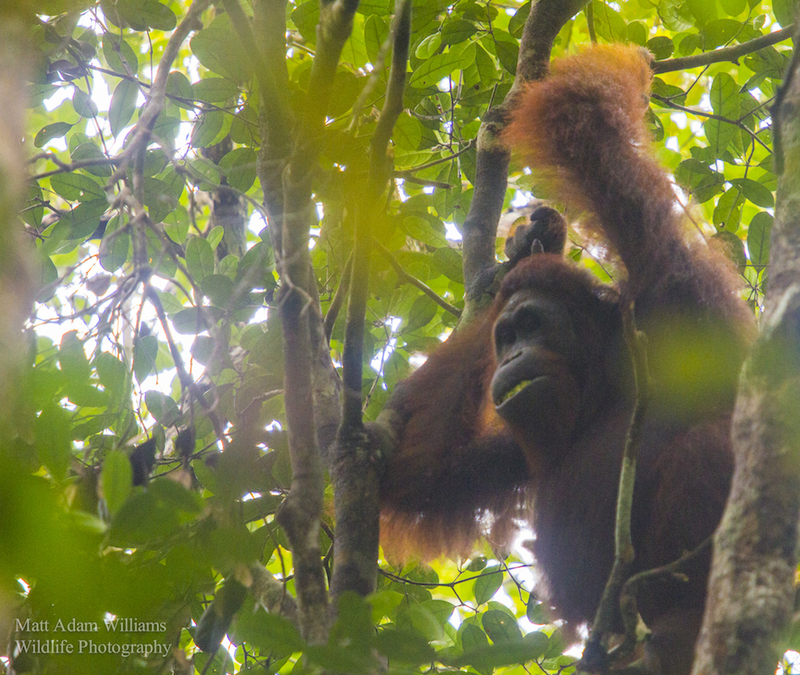 As Matt and I made our way through the forest on one of the morning walks (walking through knee-deep peat-swamp), we had a direct encounter with a young male Orangutan. Fully focused on eating fruits 10 meters up in a tree, the Orangutan did not notice Matt and me at first. As I cracked a branch, the Orangutan suddenly saw us. He looked us straight into the eyes, grabbed a branch above his head and snapped it from the tree. He held it threatingly above his head, and then threw it to the ground with his strong arms. Then, he aggressively swung his body to another tree and Matt and I left the site. It made a deep impression on me. 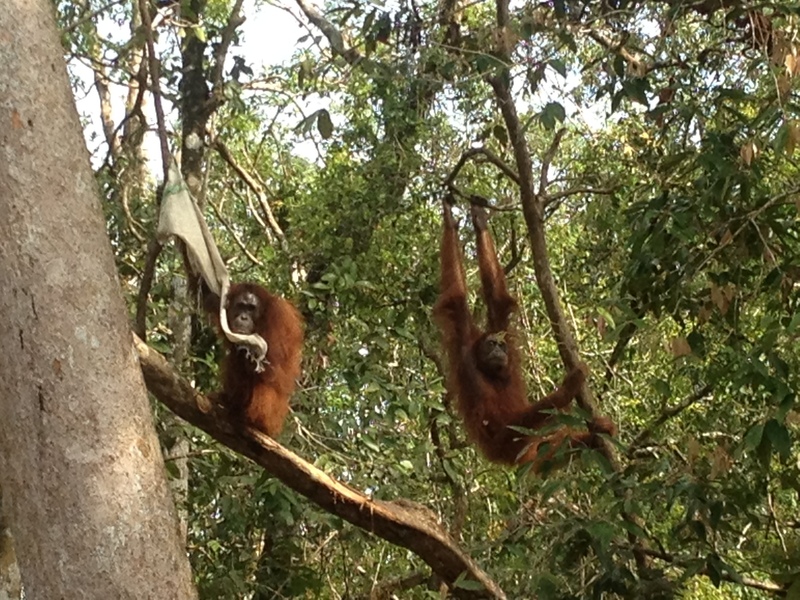 Leaving Kalimantan tomorrow to meet with Willie Smits, the Orangutans have left a deep impression on me. They are peaceful animals, able to determine their own plan, not disturbed by the process of group decisions. I came to see the Orangutan as the “philosopher king” of the animal kingdom, not disturbed by trivial matters, peacefully exerting only the necessary effort, solitary contemplating the meaning of life (whilst chewing leaves) from a treetop. When did you feel a deep connection to other animals? This entry was posted in Diary, Travel and tagged Borneo, Caroline Howe, Casper ter Kuile, Kalimantan, Matt Adam Williams, Orangutan, OUtrop. Bookmark the permalink.